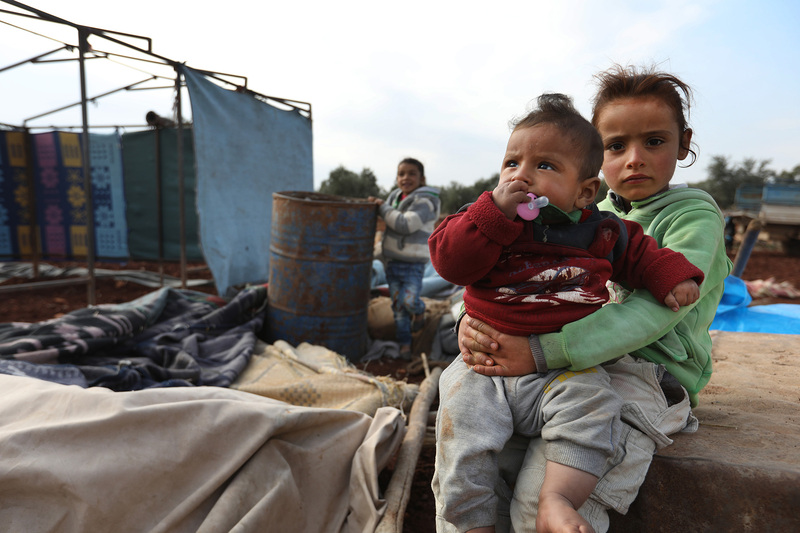 Intense fighting, including airstrikes and ground shelling, has dramatically intensified since mid-December in northern Syria, fuelling one of the largest displacements of people since the war began. The increased violence, concentrated in areas of northeast Hama, southern Aleppo and southern Idlib governorates, is taking a profound toll on the population, already suffering from nearly seven years of conflict. Tens of thousands of families have fled north towards the Turkish border, where they are living in overcrowded tents or makeshift shelters in frigid winter conditions. Abu Mustafa, a 37-year-old father of six, arrived in Sarmada, a town near the Turkish border, with next to nothing. He and twenty other families pooled their money to rent a small piece of farmland for roughly $1,000 per month. “We had no other option. We needed somewhere to sleep,” he said. The families built makeshift shelters using iron pillars, and covered them with blankets and plastic bags. There are no floors, leaving no protection from the dirt ground, which is wet and full of frost. “The cold seeps through everywhere,” Abu said. Many of these families left home with very little or nothing. Others carried their belongings piled high on trucks and tractors, salvaging farm equipment, appliances or other valuables that they can later sell to survive. They say the mass displacement has left a number of villages virtually abandoned. 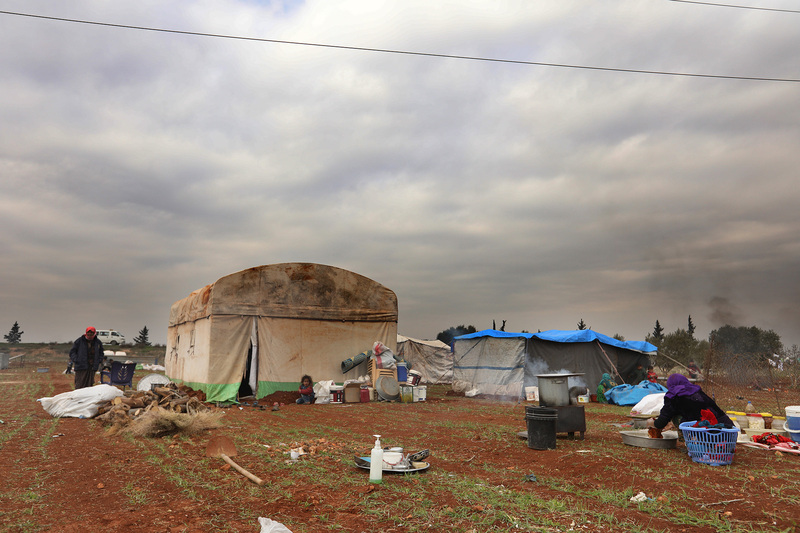 Formal camps in the area have swelled beyond capacity, leaving most internally displaced people to find refuge in 160 makeshift settlements, which are spread over a large area. They are living in improvised tents, with as many as three or four families in each. Most of the families have an average of six members. In these informal camps, there is limited access to basic shelter, sanitation, food, water and medical care. 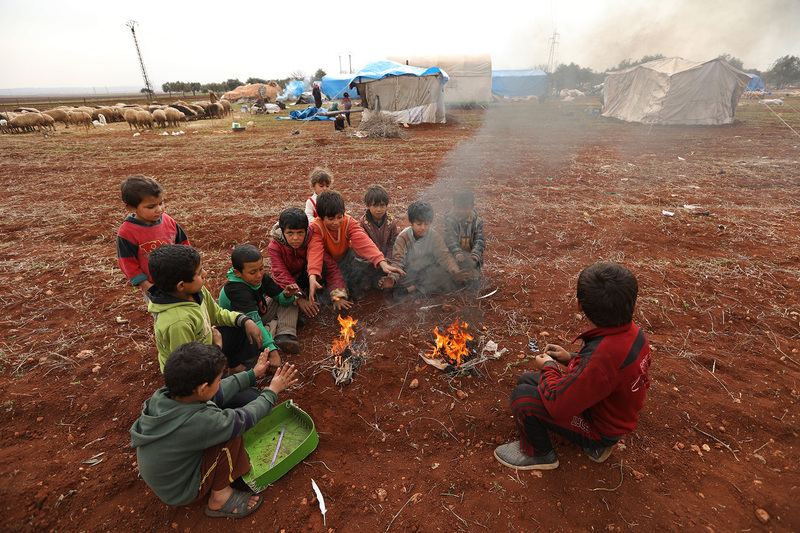 The wet, cold weather and overcrowded camps threaten to contribute to a further deterioration of conditions at a time when many humanitarian actors are scaling back operations inside Syria. Dr Mohammed Yaakoup, an MSF mobile medical team member, recently visited Al-Rahman camp near to Turkish border. Forty-four newly displaced families had recently arrived in the camp, where 70 families were already living. The ballooning population is significantly straining the limited camp facilities. “The medical situation is really difficult. Respiratory tract infections are very common. Some families have been travelling for one week before arriving here, camping by the side of the road, in the open air,” he said. The doctor is providing some 45 consultations per day and a midwife in the team is giving around 15. MSF teams have also been distributing hygiene and winter kits, including blankets and insulating sleeping mattresses. So far, kits have been distributed to more than 1,000 families. MSF is giving additional support, including donations of medical supplies, to boost the capacity of some key healthcare facilities and emergency referrals in the area. MSF is also supporting ambulance services through the provision of fuel and maintenance. In the coming weeks, MSF teams will expand the vaccination outreach programme, and coordinate with other organisations to try to efficiently continue the distribution of relief kits to those in the most urgent need. Meanwhile, the airstrikes persist, forcing those who have been driven from their homes to flee yet again. "One of the settlements that we visited was attacked several days later. 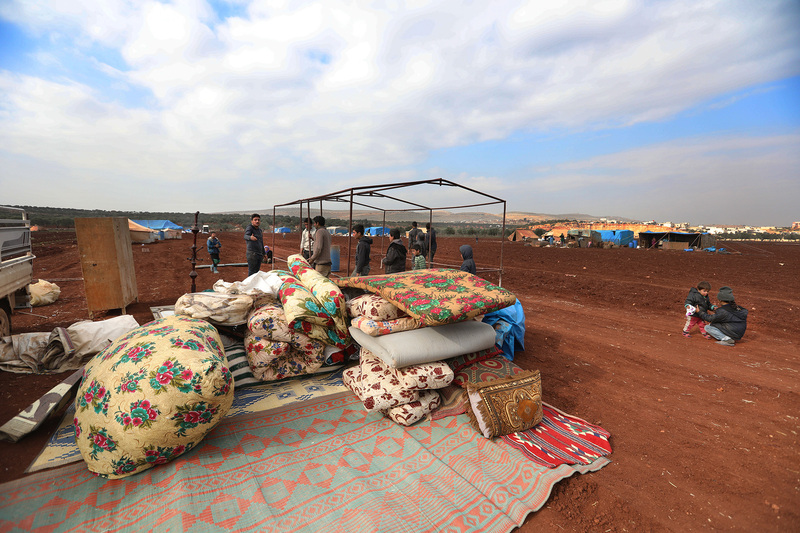 People were forced to move again," said Zuhair Kanjou, MSF project manager for North Syria. "The shelters where they live are not suitable for people. They flood with rain and are full of mud. The situation is miserable,” he said.